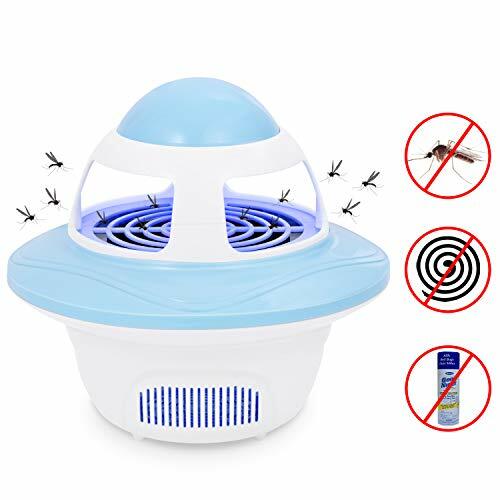 Safe & Eco-Friendly---No toxic, no odor and no chemicals, healthy physical way to kill mosquito, safe to kids, pets, baby and pregnant. Simple to Operate---Plug-and-play, lightweight and portable, convenient to use at different rooms. Detachable Box & Reusable---Easy to clear up the dead mosquito body and clean the inside. No Annoying Noise---Not disturb your sleeping at night, enjoy quiet and peaceful sleeping night. Unique UFO Shape---Brand-new design can be not only a bug zapper, but also a cute and adorable decoration at home. Close the door and windows, letting it work for about 2-3 hours with people leaving for better effects. Place the insect killer light 1.6ft-3.3ft above the ground for better effect. Placing the bug zapper light at the corner of the room can get better effect. The mosquito killer light can get better catching effect in dark light. It will catch more mosquitoes if people not in the room, since the human body is more attractive to them. Please avoid falling it off from high, or the fan blades might be damaged. Please do not open the collection tray frequently. Let the fan work until the mosquito dehydration dry. The product is not waterproof, so please store the product away from water. Safe and Non-Toxic: The LED mosquito killer lamp adopts safe and healthy physical way to kill mosquito. No toxic, no odor and no chemical substance, 100% safe to human and environment, which is healthier than traditional pest repellent, spray and incense. Perfect for baby, kids, pregnant women, the aged and pets. Easy to Use and Clean: The mosquito trap can be direct charging with computer, power bank, USB adapter, etc. (Power Adapter Not Included). Cute UFO shape design is portable and lightweight so that you can kill the insects anytime and anywhere. 5V working voltage ensures safe to touch and energy-saving. Large mosquito box can store amounts of small dead insect bodies. Detachable design allows the box an easy removal and easy cleaning, just power out the dead body for next round use. Noiseless Sleep Night: The sound of fan less than 40db, enjoy a quite night without harassment of mosquito. Please don't put this mosquito killer lamp nearby you and put it under the bed for better effect. 12 Month Warranty: Every order from us enjoys one year warranty for replacement or refund. For any questions about the item, please just email us and we will reply you within 24 hours. If you have any questions about this product by Dumax, contact us by completing and submitting the form below. If you are looking for a specif part number, please include it with your message.